Major/Minor Work Wednesday is a semiregular feature that takes a look at recently filed applications with the Raleigh Historic Development Commission. Formerly known as Bradley’s Service Garage, the former service station was originally built in 1964, seven years after the land came into the hands of the Bradley family. It sits directly behind the Marbles Kids Museum at Moore Square. We’re not sure if this was the same family that once operated Bradley’s Crown Service Station on South Person Street, and couldn’t find much further information about its time as a mechanic shop. The Bradley heirs eventually sold the property to an LLC by the name of Herndon & Herndon Enterprises in 2006, around which point we think it was home to Z-Mech Auto, which is now located on Oak Forest Drive. Herndon & Herndon eventually lost the property to the City & the County as part of a judgment in a lawsuit the entities had brought against the real estate firm in 2012. The property was acquired by the Marbles Kids Museum in an upset bid process for a little more than $50,000; the original buyer, when the property was auctioned off on the courthouse steps, had offered slightly more than $30,000 for the land. Not surprisingly, a year-and-a-half after losing the Blount Street property to the government, the former president of Herndon & Herndon, Treshell Mayo Herndon was “sentenced to 33 months and ordered to pay $1.1 million in restitution” in an unrelated case. Herndon was described by the News & Observer as a “former Raleigh real estate broker” and was one of eight sentenced in a $44 million mortgage-fraud scheme. For the full FBI Press release on the case, click here. Marbles doesn’t seem to have done anything with it since that initial purchase: the last permit we could find was from February 2010, when a sign was installed for Z-Mech. It looks like that’s about to change. 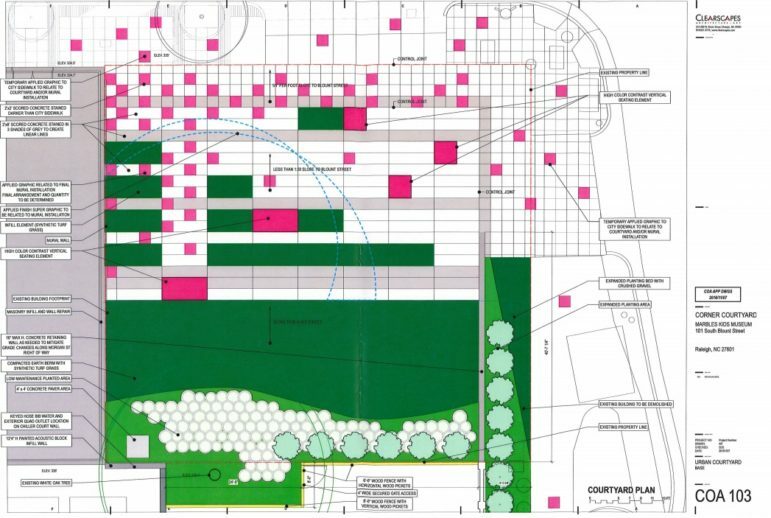 Nearly three-and-a-half years after dropping $50,000 on the land, the museum has filed an application with the Historic Development Commission laying out its future plan for the site: the creation of an Urban Courtyard. Designed by Clearscapes Architecture, which has worked with Marbles in the past on projects such as the 2014 Kid Grid Expansion, the Urban Courtyard would see the entire property razed and turned into an outdoor green space. For the curious: no, 101 Blount is not classified as a historic home/resource, but it is located in the historic Moore Square District, which is why the application was required. We’re taking “interim” to mean this courtyard is essentially a placeholder for a physical expansion of the museum, but time will tell. 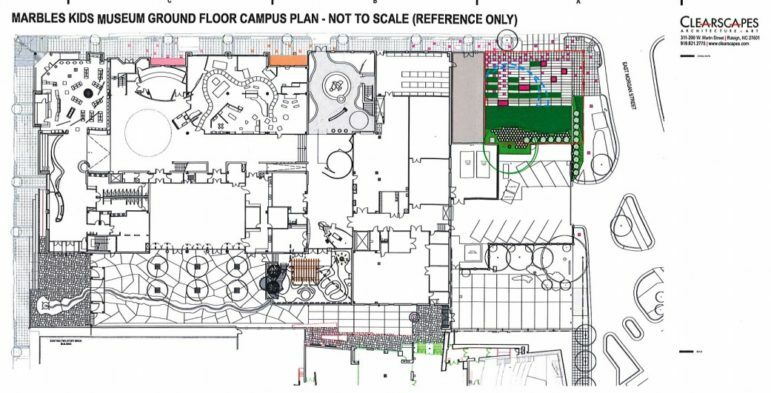 The courtyard will apparently contain stained concrete with three stain colors: “natural, 15 percent gray and 35 percent gray.” Who knew there were so many shades of concrete? Details of the new mural, including the colors and design are still being worked out, but considering the “Urban Courtyard” is essentially just that — a courtyard in an urban setting — we imagine that no matter what the mural ends up being, it will be the highlight of the site. Note: Marbles is currently in the midst of a 10-year master plan process that kicked off in January of 2015, we imagine that the permanent plans for the 101 S. Blount site will no doubt be developed as part of this process.